I've always believed that "you're only as old as you feel" chesnut. When someone tells you "I must be getting old" they are just about to swing into some really boring explanation of why they didn't do something interesting and instead just sat around the house watching TV. When someone tells you "I must be getting old", you as the respondent are left with nothing to say because if you say "yeah, you are getting old" you're being unkind, and if you say "no, you're not getting old" that just leads to more explanation by the "getting old" person of why they chose to sit and watch TV all night instead of doing something interesting. Which makes it even more painful for me to tell you that I must be getting old or something. Tonight this band I've always liked is playing downtown and I'm not going. They're the Red Elvises and they combine a perfect combination of kitschy rockabilly, lounge, horns and Soviet-style accents. They play homage to styles of music in a way that only truly deliberately bad performers can. And tonight, Monday, they're at Rally's (for God knows what reason) and instead of going to see them, I am instead listening to all of their records on Rhapsody while writing this blog entry. That makes me a hopeless nerd on so, so many levels. And an increasingly old one at that. To be honest, the sedentary, don't go out on School night Scot has been dominant for years now. It's gotten so bad in recent times that even during my far-as-the-eye-can-see Summer Vacations I rarely go out to the Launchpad, etc. to see a show with them there youngsters. Part of it is the volume of the tunes (I've never been one for really loud), but I switched to old fogy ear plugs some years back and solved that problem. I could also blame factors such as standing on my feet for such long periods (I never get to the Launchpad, e.g., in time to sit on the sofa), but I spend equal time or more standing up at work all the time. It's not even the late hour of the music...I admit I stay up way too late far too often. The salient fact of the matter is that I've turned into this Mt. Everest of Home-Bodies. Between sitting home online and going out, online wins. Between reading with one or more frosty glasses of adult beverage and hitting a bar, I'm plopped down at home with the book. Between the Guild and Netflix, I'm almost always picking Netflix. In short, I"m pathetic. Of course, I realize that I have not been alone all these years in bristling at those who say "I must be getting old", and that you, dear reader, may not have made it this far down the blogpost for the simple aforementioned fact that "getting old" comments are boring. But, if you have made it this far, perhaps it is because you too know what I'm talking about. I mean, you are reading a blog right now. You might even be reading it at home instead of doing something far, far more interesting. Maybe you too, are "getting old, or something". Maybe you too didn't go to the Brave Combo concert this past weekend supposedly because "you've seen them enough already" or missed Oliver Mtukudzi and all of Globalquerque on the pretense that "the tickets were too expensive". Well, we're in this together, fellow boring old person. We are both members of the club of people who still want to go see all these shows, but can't make the movement to go. It's as if we are aging shortstops who used to be able to cover the ball up the middle and now just watch it roll on by into centerfield. 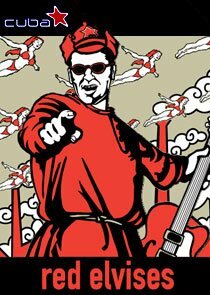 So I'm here on a Monday night listening to "Grooving to the Moscow Beat" by the Red Elvises and wondering if I should turn it up full blast, put on some ear plugs, stand up for a few hours, order a Pabst Blue Ribbon from the refrigerator and blow some cigarette smoke through the house. I could even charge myself $10 to make it more real. Nah, that wouldn't work. I'd just be some loser drinking lousy beer alone (my wife would have fled to the barn immediately) in my sweatpants in front of a laptop. Plus, my clothes and couch would get all smoky. Guess I better just admit defeat, join AARP, sell all my rockabilly ties on Ebay and develop a strong attraction to KNME pledge shows on the Grateful Dead and Moody Blues. Man, that's reaching rock bottom. Absolute rock bottom. Give me those car keys...we're going to the Red Elvises...oh wait, I've got a meeting before school tomorrow. Better stay at home and get some sleep. Yeah, that makes more sense. Hey Scot, I was right there with you until that gratuitous crack about the Grateful Dead fundraising telethon on PBS. Another lawsuit could be headed your way. Watch it. Yup. I agree with you. I am also 45 and refuse to grow old. Being old is only in the mind. If you think you are old, then you are. So my mantra is to keep fit and healthy to enjoy life and most of all, music.